The ancestor of the Dachshund lived in Germany and was larger than today’s Dachshund. Their wiry body was used for flushing out badgers as well as hunting rabbits, deer and foxes. Why are Dachshunds called teddy bear dogs? The Dachshund is a hound-type dog breed with short legs and long body. It has very small size and that’s why its appearance reminds us of a stuffed teddy bear. It is categorized as a teddy bear dog along with many other small-sized dogs, however odd their sausage-like shape may be. Some experts theorize that the roots of dachshund dogs come from ancient times in Egypt. They have found engravings of dogs from those times which look similar to Dachshunds. 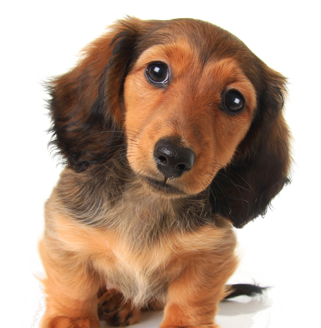 In their more recent history we know that Dachshunds were created by German breeders and come from terriers and English, French and German hounds. The coat of the Dachshunds can be wire-haired, long-haired or smooth-coated. The coat of the long-haired dachshund is silky and they have short featherings on their ears and legs. The wire-haired Dachshunds are most common in Germany. Dachshunds may be found in many colors and patterns. If their coat is just the one color it is usually cream or red or it may have a tinge of tan in it. Dachshunds are known as playful dogs, but they can be stubborn. Since they are hunting dogs they usually chase toys, birds and small animals. They are a real challenge when it comes to training. They can be aggressive towards other dogs and to strangers but they are really intelligent. Some may like to bark a lot, while others may not bark at all. Their bark can be really loud, but this can be treated with proper training. Dachshunds are loyal and devoted to their owners and people they love. They are prone to whining if they feel alone and will do so until they find someone to keep them company. When they are stressed they like to chew objects. They also like to burrow things when they are bored. Dachshunds can be found in three sizes: kaninchen, miniature and standard. Most Dachshunds are either miniature or standard size. The smaller kaninchen is not an official size, and standard dachshunds are not known as teddy bear dogs. Miniature dachshunds weigh up to 8.8lbs (4kgs) and are 5 to 6 inches (13 to 15cms) in height. The kanninchen weighs between 3.6 and 5 kg (8lb and 11lb) and would be considered a teddy bear dachshund. The average life expectancy for a Dachshund is 12.7 years. What's so unique about them? featured in many movies and cartoons.